We decided on a Life-Sized Pac-Man game! I originally saw the idea on a youth-group website, but I couldn’t find any real instructions on how to actually set it up or clear rules on how to play, so I just made it up. Feel free to adjust to your own needs. I think they adapted it a bit, which was totally fine (using actual chairs is a little different than drawing a straight line!) It just needs to be some sort of maze with at least a few entrances/exits. They used ALL the chairs from our table/chair storage room and the chapel overflow. It was AWESOME! We used white lids (that I already had) from the dry-pack cannery as the power-pellets. You could use frisbees or paper plates instead. Pellets were distributed around the maze before each round. 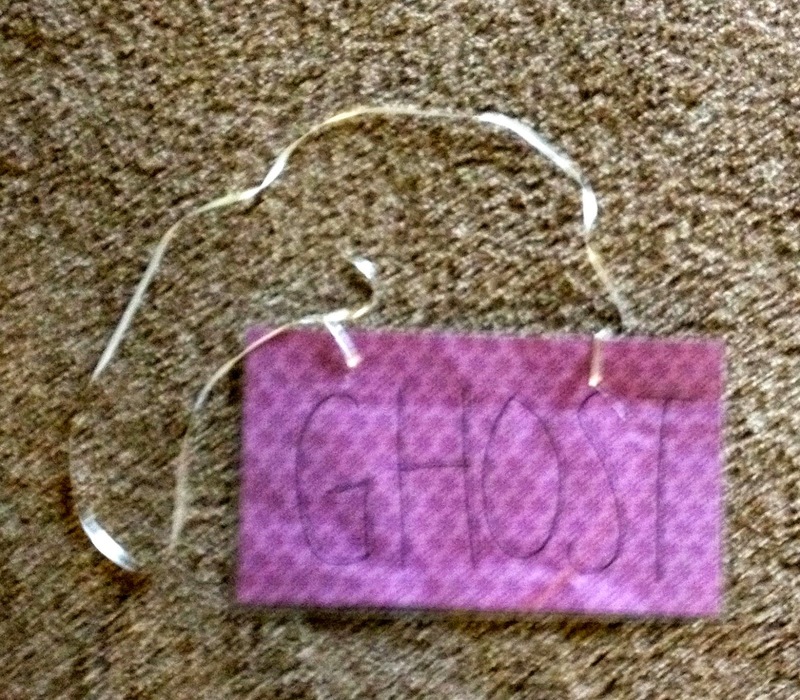 I made “ghost” signs for the 2 people who volunteered to be the ghosts, so the audience could tell who was who! Once the game starts, its sort of a frenzy! 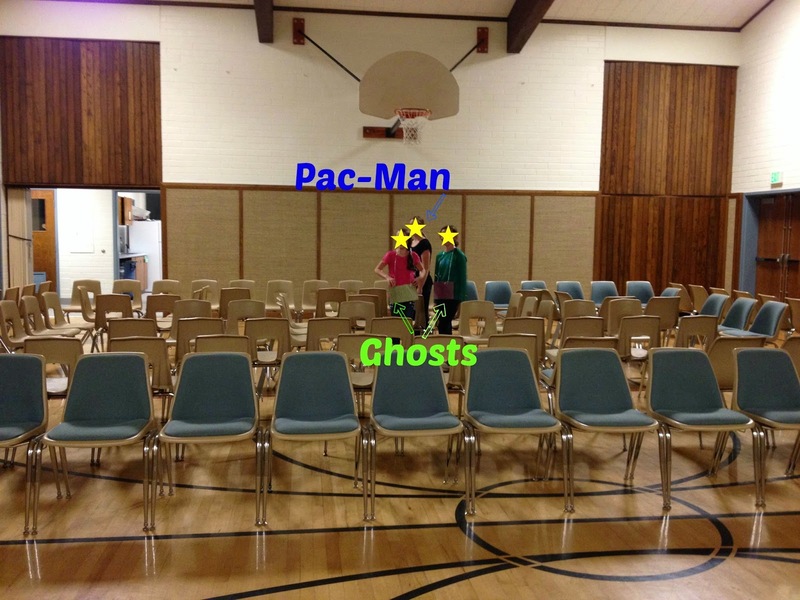 Pac-Man and the ghosts (we had 2, you could add more) all started in the middle. We gave Pac-Man a 5-second head-start, then the ghosts could leave the center and start pursuing Pac-Man. The object was for Pac-Man to collect all 6 Power-Pellets without being tagged by a ghost. The Power-Pellets did not give Pac-Man special powers or immunity. Instead, we placed 1 special (striped) pellet in the maze that Pac-Man could use for immunity for 1 “tag”. The striped pellet did not count as one of the 6 pellets that they had to collect to win. This is different than the game of course, but had to make some adjustments for real-life! 2. Pac-Man can walk quickly (we found running to be surprisingly dangerous), but ghosts MUST walk slowly (Frankenstein style). 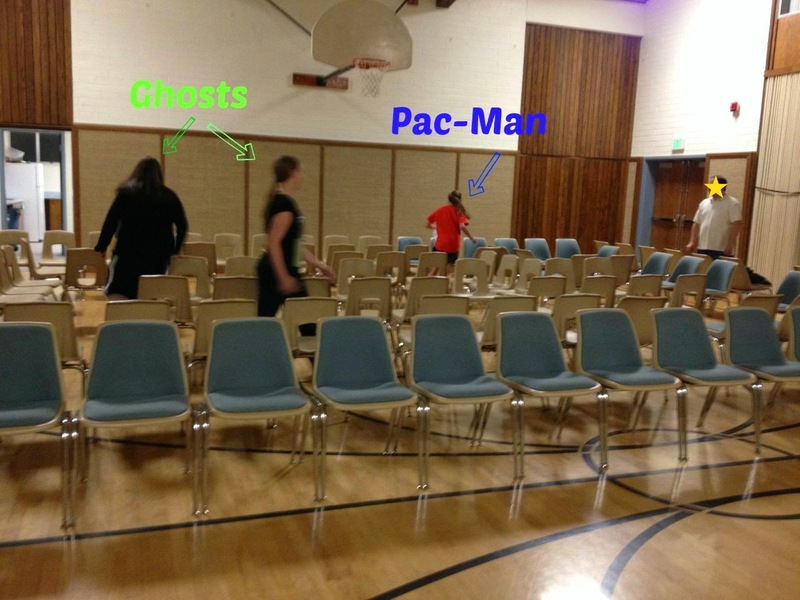 Fun activity, everyone got a chance to be Pac-Man and/or a ghost a couple of times. No cost, easy to do, and different!